this is a blog called geometricsleep. : "What Watch? Ten Watch"
Fact about me: I haven't seen any movie you think I should've seen by now. This is 100% true BUT I am trying to remedy this (also having Netflix Instant helps a lot! 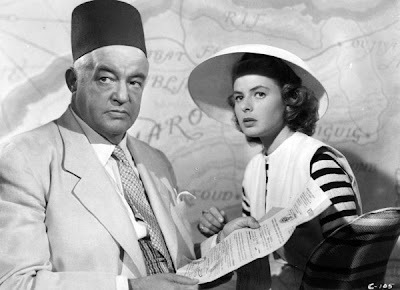 ), and so I finally watched Casablanca over Christmas. As soon as Ingrid Bergman appeared on the screen wearing a jumper dress over a little striped tee I just about died! How have these movie stills not been popping up in magazines lately? The look is so perfectly now! In fact, it's so now that I've created a Photoshop masterpiece of what said inspiration would look like styled with pieces from the spring collections. 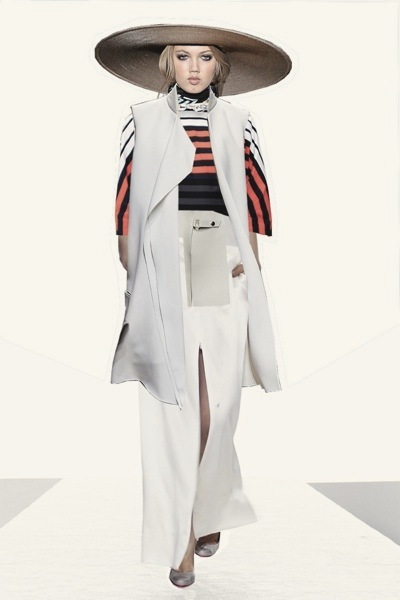 Celine vests, The Row skirt and Jil Sander pumps. I'm really into all the different shades of white and cream together, and the huge hat gives it a slightly sinister-via-Lydia Deetz vibe. The shirt is not as casual as the tee she wears, but I think the relaxed but poised vibe still comes through. ha ha. this is good. very good. r u taking movie suggestions? cat on a hot tin roof. greatest less-is-more styling EVER. well, it gets my vote. i will put it in my queue! Absolutely love this and the spirit in which it was done. Hopefully this won't start a barrage of suggestos, but "Desk Set" with Katherine Hepburn (which as of a few months ago was streaming on netflix) also has wonderful, fresh clothes and plenty of charm. Hepburn plays the head of the research department at a big TV station and knows all kinds of adorable facts. and stuff. ughhhhhh I have way too much love for this post. It is so clever and creative. I think I need to see casablanca! i agree with readysetfashion...cat on a hot tin roof is one of my favorite movies of all time!!!! so amazing and beautifully styled. desk set will now be added to the queue as well. 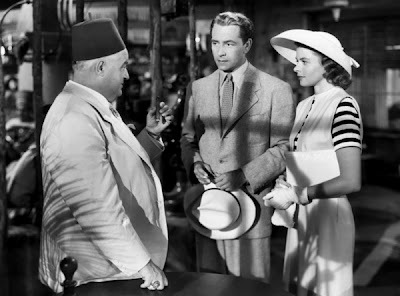 Oh Casablanca. Lovely, adorable movie. Ingrid Bergman was such a beautiful and strong woman. Super cool, you have a talent!! Love your blog, following now!! you have a great sense of fashion. Wow you're a photoshop god of sorts.